The term "managerism" coined by the author describes the form commonly found today of how companies are led, how added value is used and how people and values are treated. Advised by external consultants and stimulated by financial analysts, many managers have adopted a certain distance to their employees, who are now generally known as "FTEs", "headcount", or "human capital". Only recently have we been experiencing a lack of solidarity among company sites or divisions, a decrease in social responsibility and a loss of values. This development first seen in Germany in the 1990ers first culminated in the Internet-hype at the turn of the millennium and again during the recent bank crisis; it recurs at ever diminishing intervals. 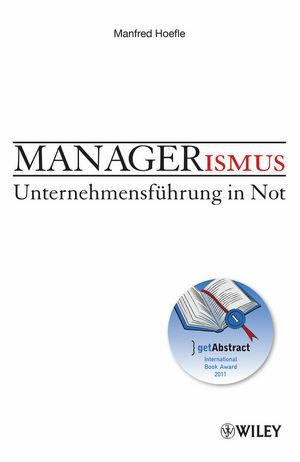 Manfred Hoefle describes the phenomenon of managerism as a generic defect among the management of predominantly listed companies. Mainly it is a deformation of management, as observed and taught by Peter Drucker. Or to put in another way: It is Gresham's Law: Bad behavior expels good behavior, because it is supposedly more successful. - the effects of news- and story-triggered media, arrogant consultants and interventionist politicians. Particular facets of managerism are illustrated in the manner of warnings, such as mercenaries in management, and the role of the consultant as "shaping fashions", etc. The book names and describes the deformation in concrete terms, while at the same time showing ways to escape and help.